OpenStack Networking allows you to create and manage network objects, such as networks, subnets, and ports, which other OpenStack services can use. Plug-ins can be implemented to accommodate different networking equipment and software, providing flexibility to OpenStack architecture and deployment. The Networking service, code-named neutron, provides an API that lets you define network connectivity and addressing in the cloud. The Networking service enables operators to leverage different networking technologies to power their cloud networking. The Networking service also provides an API to configure and manage a variety of network services ranging from L3 forwarding and NAT to load balancing, perimeter firewalls, and virtual private networks. The OpenStack Networking API includes support for Layer 2 networking and IP address management (IPAM), as well as an extension for a Layer 3 router construct that enables routing between Layer 2 networks and gateways to external networks. OpenStack Networking includes a growing list of plug-ins that enable interoperability with various commercial and open source network technologies, including routers, switches, virtual switches and software-defined networking (SDN) controllers. Plugs and unplugs ports, creates networks or subnets, and provides IP addressing. The chosen plug-in and agents differ depending on the vendor and technologies used in the particular cloud. It is important to mention that only one plug-in can be used at a time. Accepts and routes RPC requests between agents to complete API operations. Message queue is used in the ML2 plug-in for RPC between the neutron server and neutron agents that run on each hypervisor, in the ML2 mechanism drivers for Open vSwitch and Linux bridge. To configure rich network topologies, you can create and configure networks and subnets and instruct other OpenStack services like Compute to attach virtual devices to ports on these networks. OpenStack Compute is a prominent consumer of OpenStack Networking to provide connectivity for its instances. In particular, OpenStack Networking supports each tenant having multiple private networks and enables tenants to choose their own IP addressing scheme, even if those IP addresses overlap with those that other tenants use. 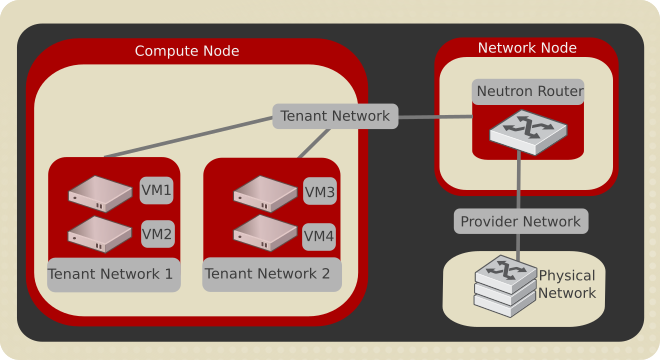 There are two types of network, tenant and provider networks. It is possible to share any of these types of networks among tenants as part of the network creation process. Provider networks offer layer-2 connectivity to instances with optional support for DHCP and metadata services. These networks connect, or map, to existing layer-2 networks in the data center, typically using VLAN (802.1q) tagging to identify and separate them. Provider networks generally offer simplicity, performance, and reliability at the cost of flexibility. Only administrators can manage provider networks because they require configuration of physical network infrastructure. Also, provider networks only handle layer-2 connectivity for instances, thus lacking support for features such as routers and floating IP addresses. In many cases, operators who are already familiar with virtual networking architectures that rely on physical network infrastructure for layer-2, layer-3, or other services can seamlessly deploy the OpenStack Networking service. In particular, provider networks appeal to operators looking to migrate from the Compute networking service (nova-network) to the OpenStack Networking service. Over time, operators can build on this minimal architecture to enable more cloud networking features. In general, the OpenStack Networking software components that handle layer-3 operations impact performance and reliability the most. To improve performance and reliability, provider networks move layer-3 operations to the physical network infrastructure. In one particular use case, the OpenStack deployment resides in a mixed environment with conventional virtualization and bare-metal hosts that use a sizable physical network infrastructure. Applications that run inside the OpenStack deployment might require direct layer-2 access, typically using VLANs, to applications outside of the deployment. Self-service networks primarily enable general (non-privileged) projects to manage networks without involving administrators. These networks are entirely virtual and require virtual routers to interact with provider and external networks such as the Internet. Self-service networks also usually provide DHCP and metadata services to instances. In most cases, self-service networks use overlay protocols such as VXLAN or GRE because they can support many more networks than layer-2 segmentation using VLAN tagging (802.1q). Furthermore, VLANs typically require additional configuration of physical network infrastructure. IPv4 self-service networks typically use private IP address ranges (RFC1918) and interact with provider networks via source NAT on virtual routers. Floating IP addresses enable access to instances from provider networks via destination NAT on virtual routers. IPv6 self-service networks always use public IP address ranges and interact with provider networks via virtual routers with static routes. The Networking service implements routers using a layer-3 agent that typically resides at least one network node. Contrary to provider networks that connect instances to the physical network infrastructure at layer-2, self-service networks must traverse a layer-3 agent. Thus, oversubscription or failure of a layer-3 agent or network node can impact a significant quantity of self-service networks and instances using them. Consider implementing one or more high-availability features to increase redundancy and performance of self-service networks. Users create tenant networks for connectivity within projects. By default, they are fully isolated and are not shared with other projects. OpenStack Networking supports the following types of network isolation and overlay technologies. All instances reside on the same network, which can also be shared with the hosts. No VLAN tagging or other network segregation takes place. Networking allows users to create multiple provider or tenant networks using VLAN IDs (802.1Q tagged) that correspond to VLANs present in the physical network. This allows instances to communicate with each other across the environment. They can also communicate with dedicated servers, firewalls, load balancers, and other networking infrastructure on the same layer 2 VLAN. VXLAN and GRE are encapsulation protocols that create overlay networks to activate and control communication between compute instances. A Networking router is required to allow traffic to flow outside of the GRE or VXLAN tenant network. A router is also required to connect directly-connected tenant networks with external networks, including the Internet. The router provides the ability to connect to instances directly from an external network using floating IP addresses. A block of IP addresses and associated configuration state. This is also known as the native IPAM (IP Address Management) provided by the networking service for both tenant and provider networks. Subnets are used to allocate IP addresses when new ports are created on a network. End users normally can create subnets with any valid IP addresses without other restrictions. However, in some cases, it is nice for the admin or the tenant to pre-define a pool of addresses from which to create subnets with automatic allocation. Using subnet pools constrains what addresses can be used by requiring that every subnet be within the defined pool. It also prevents address reuse or overlap by two subnets from the same pool. See Subnet pools for more information. A port is a connection point for attaching a single device, such as the NIC of a virtual server, to a virtual network. The port also describes the associated network configuration, such as the MAC and IP addresses to be used on that port. Routers provide virtual layer-3 services such as routing and NAT between self-service and provider networks or among self-service networks belonging to a project. The Networking service uses a layer-3 agent to manage routers via namespaces. Security groups provide a container for virtual firewall rules that control ingress (inbound to instances) and egress (outbound from instances) network traffic at the port level. Security groups use a default deny policy and only contain rules that allow specific traffic. Each port can reference one or more security groups in an additive fashion. The firewall driver translates security group rules to a configuration for the underlying packet filtering technology such as iptables. Each project contains a default security group that allows all egress traffic and denies all ingress traffic. You can change the rules in the default security group. If you launch an instance without specifying a security group, the default security group automatically applies to it. Similarly, if you create a port without specifying a security group, the default security group automatically applies to it. If you use the metadata service, removing the default egress rules denies access to TCP port 80 on 169.254.169.254, thus preventing instances from retrieving metadata. Security group rules are stateful. Thus, allowing ingress TCP port 22 for secure shell automatically creates rules that allow return egress traffic and ICMP error messages involving those TCP connections. Allow egress traffic only if it uses the source MAC and IP addresses of the port for the instance, source MAC and IP combination in allowed-address-pairs, or valid MAC address (port or allowed-address-pairs) and associated EUI64 link-local IPv6 address. Allow egress DHCP discovery and request messages that use the source MAC address of the port for the instance and the unspecified IPv4 address (0.0.0.0). Allow ingress DHCP and DHCPv6 responses from the DHCP server on the subnet so instances can acquire IP addresses. Deny egress DHCP and DHCPv6 responses to prevent instances from acting as DHCP(v6) servers. Allow ingress/egress ICMPv6 MLD, neighbor solicitation, and neighbor discovery messages so instances can discover neighbors and join multicast groups. Deny egress ICMPv6 router advertisements to prevent instances from acting as IPv6 routers and forwarding IPv6 traffic for other instances. Allow egress ICMPv6 MLD reports (v1 and v2) and neighbor solicitation messages that use the source MAC address of a particular instance and the unspecified IPv6 address (::). Duplicate address detection (DAD) relies on these messages. Allow egress non-IP traffic from the MAC address of the port for the instance and any additional MAC addresses in allowed-address-pairs on the port for the instance. Although non-IP traffic, security groups do not implicitly allow all ARP traffic. Separate ARP filtering rules prevent instances from using ARP to intercept traffic for another instance. You cannot disable or remove these rules. You can disable security groups including basic and anti-spoofing rules by setting the port attribute port_security_enabled to False. The OpenStack Networking service is extensible. Extensions serve two purposes: they allow the introduction of new features in the API without requiring a version change and they allow the introduction of vendor specific niche functionality. Applications can programmatically list available extensions by performing a GET on the /extensions URI. Note that this is a versioned request; that is, an extension available in one API version might not be available in another. The optional DHCP service manages IP addresses for instances on provider and self-service networks. The Networking service implements the DHCP service using an agent that manages qdhcp namespaces and the dnsmasq service. The optional metadata service provides an API for instances to obtain metadata such as SSH keys. Provides API, manages database, etc. The Virtual Private Network-as-a-Service (VPNaaS) is a neutron extension that introduces the VPN feature set. The Load-Balancer-as-a-Service (LBaaS) API provisions and configures load balancers. The reference implementation is based on the HAProxy software load balancer. The Firewall-as-a-Service (FWaaS) API is an experimental API that enables early adopters and vendors to test their networking implementations.